Picture this. It’s 1 a.m. You’re in the middle of a particularly lovely dream about a quiet family dinner taking place in one of those dining rooms that only really exists in a Pottery Barn catalog. And then you hear it. That unmistakable cry. The baby’s awake. Again. It’s a relatable situation for way too many parents and one of the most common sleep issues families face (not to mention one of the major reasons for Nanit’s existence!). In fact, parents on average lose 44 days of sleep in their baby’s first year alone. And, although many babies are able to sleep through the night by 6 months without waking to feed, it’s not always that simple. Even if your baby has reached that milestone, any number of issues can throw their nighttime zzz’s off, resulting in disrupted sleep for the baby and you. So what on earth can you do about it? Here’s our checklist for what to do if your baby isn’t sleeping through the night. It might seem dull and boring, but there’s power in repetition and routine, at least when it comes to your little one’s sleep. A consistent sleep schedule helps babies feel safe. If middle-of-the-night wakeups are an issue, take a moment to review your baby’s bedtime routine. How do you prepare your infant for bed each night? Do you follow the same set of steps and rituals? Or do you change things up every night? A predictable, no-surprises bedtime routine is an absolute must. Not only does it give infants a greater sense of security, but following the same steps before bed every night lets babies know that sleepytime is coming and puts them in the sleep zone. It’s a win-win situation! The more consistent the routine the better. So, for example, if you decide to read a book before bed with your baby every night, read it in the same place. Bedtimes too should happen at the same time every night. Pick one time and stick to it as best as possible. A sample routine for a baby over 4 months might go down like this. After the last feed of the day, dim the lights in the house. Walk your baby over to the nursery. Read a bedtime book or two. Turn on the white noise. Then place your baby in their crib, drowsy but still awake, and say something like, “I love you, sweet dreams.” Those simple actions repeated in the same way every night – even with the same signature sleep catchphrase – can make a world of difference. The way in which your baby falls asleep at night is telling. Many experts recommend putting babies to bed drowsy, but not fully asleep, that way they can learn how to fall asleep on their own. If little ones are rocked to sleep, for example, they might get used to you doing the work of falling asleep for them. It might seem like you’re doing them a kind favor at the time. But if they wake up in the middle of the night, they might be unable to get themselves back to sleep without you stepping in to rock them. Hence those dreaded midnight wakeup calls. As best as you can, weed out any negative sleep associations, aka behaviors that do the work of falling asleep for your baby, that may exist in your infant’s pre-sleep routine. That includes feeding or rocking your baby to sleep. Want to know more? Read up on negative – and positive! – sleep associations here. Believe it or not, what happens in the daytime is just as important as what happens at night. If your baby is getting too much sleep during naptime, that might affect their ability to sleep at night. Too little sleep also plays a role. If an infant isn’t getting enough sleep at naptime, it could make them overtired, hyper and fussy, keeping them from sleeping continuously through the night. Daytime feeds also affect how your baby sleeps at night. Once you introduce solid foods around 4 to 6 months, be sure to monitor if your baby’s getting enough milk. Otherwise, they might wake up in the middle of the night on the lookout for it. And, just like with baby’s bedtime routine, try to keep daytime sleep as consistent as possible. 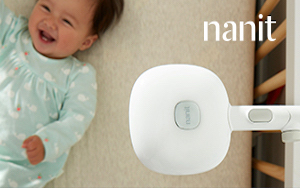 Naptimes should occur at the same times, in the same place – ideally the crib – and under the same conditions as nighttime sleep. You can even mimic the bedtime routine before naptime so that baby can get in the sleep zone. For example, dim the lights, read a book, turn on the white noise and repeat your signature sleep catchphrase. If your baby was sleeping through the night and then suddenly stopped, something could be disrupting their sleep. Often the culprit is a developmental or physical milestone that gets sleep off track momentarily. For example, if your baby is teething or learning how to stand up or crawl, that could disrupt their sleep. Other disruptors? Colds, illness, traveling and separation anxiety, which typically occurs after 6 months when your baby has a better sense of you. What can you do in the case of a sleep disruptor? Tend to your baby as needed, help them get through the disruption and then return to your baby’s regular sleep routine after the disruption has passed. You can check out our cheat sheet of common sleep disruptors and what to do about them here. Your baby’s sleep space is an important component of getting sleep right and can play a big role in helping your little snoozer sleep soundly through the night. First, it’s crucial that your baby has one single spot for sleep. For many families, that’s the nursery. If your baby’s crib is in your room or they’re sharing a room with a sibling, you can always section off the room with a divider so your baby has a distinct, special sleep space. Next, be sure to keep the room dark for sleep. The darker the better, since that cues the release of melatonin. You might even want to invest in blackout shades so that naps can take place in total darkness too. Keep the temperature of the sleep space cool. Footed pajamas or light layers are a good option to keep baby cozy without overheating. And white noise is one of those sleep lifesavers that’ll cancel out any sirens, honking horns or other bothersome sounds. Don’t forget to clear the sleep space of anything overly stimulating, like busy wall art or distracting mobiles. Nursery decor should be kept simple and soothing. Low key is actually a good thing when it comes to the sleep space. Lastly, introduce your little one to their sleep environment when they’re awake. Let them get used to the space and feel comfy in it during non-sleep hours. That way if they wake up in the middle of the night, they’re not startled to find they’re in the nursery. For example, say you notice that your baby gets fussy around 4 p.m. or often wakes up looking for milk around midnight. All of that information can help you modify baby’s sleep plan, whether it’s adjusting a naptime or adding in more milk to baby’s diet during the day. Tracking also helps you get to know your baby’s unique sleep cues and personality so you’ll be better able to determine if they’re just a little tired, overtired or experiencing a sleep disruption. Sometimes good sleep requires a bit of sleuthing on your part, but it’s well worth it if it leads to a better night’s sleep! Many parents feel like they have to crack the code on getting their baby to sleep all on their own, like it’s some sort of parenting test. But sleep has been leaving parents scratching their heads since pretty much the beginning of time. And it’s expected that it’s going to take time to get it right. When in doubt, turn to an expert for advice, whether it’s your pediatrician or a sleep consultant. Often they’ll be able to help decipher your baby’s sleep and recommend a number of sleep training methods that best suit your family’s needs. Even talking more openly to those in baby’s inner sleep circle – from the nanny to Grandma – can help things run a whole lot smoother. After all, good sleep isn’t a solo activity. It’s a team sport!